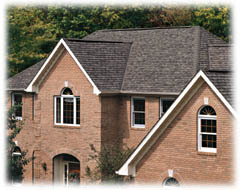 Oakridge PRO® Series Shingles from Owens Corning combine durability and weatherability with uncommon beauty. They feature laminated construction and a choice of shadow effects from subtle to deep to accentuate the unique character of any home design. A truly dramatic look of dimension is achieved by incorporating bold shadow lines both at the top and bottom of each row of shingles. Specially treated to resist roof discoloration due to algae growth. A single bold shadow line creates a slightly more modest dimensional appearance without losing the appealing, textured feel of wood. Specially treated to resist roof discoloration due to algae growth. A subtle shadow line provides an understated yet attractive complement to exteriors that already feature many different colors of stone or brick.